The people of Sudan tried to survive as one nation but were deeply divided by religion, ethnicity, and resources. In the North, most of the inhabitants are fervent Arab Muslims. While in the South the majority were black Christian and/or Animists (practicing tribal traditions). When Sudan achieved independence in 1956, the devout Islamic Northerners seized governmental power and tried to unite the entire country under Islam. The Southern people resisted forced conversion and refused to adhere to Islamic rule. In response, the Northern Arab Muslims declared a holy jihad and forcibly invaded the South. This civil war, over religious differences, lasted more than 20 years and claimed in excess of 2 millions lives. Most of the dead were peaceful Southerners who sought to worship God in their own way. 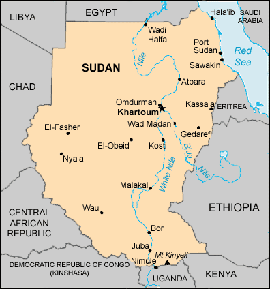 South Sudan became an independent country on July 9, 2011. It stepped onto the stage as the 193rd nation recognized by the United Nations. Great celebrations were held in Sudan as well as with the Diaspora in the U.S., Great Britain, Australia, Canada, Italy, and other places. The Lost Boys and the Sudanese Community have renewed passion for the future of their land. They are one of the very poorest countries in the world and they desperately need hospitals, schools, businesses, churches, and infrastructure. However, there is great excitement as the people begin to meet these enormous challenges. As was the tradition in Southern Sudan, young boys aged five to twelve would tend the cattle in the bush during the day. When northern Muslim armies attacked their villages, most of the boys were out with the livestock, while others were in their villages, watching as this devastation took place. the Northerners came in and killed men, women and children indiscriminately, burning their homes, stealing livestock, and destroying the villages. Many saw family members killed but others were separated from their families in the midst of the chaos and horror as they fled for their lives. Many would not know for years if their families had survived. These boys formed loose family groups and came to be known as The Lost Boys of Sudan. Those who survived enemy gunfire and capture embarked on a long, difficult walk to find refuge in Ethiopia. Many died along the way due to starvation, thirst, disease and utter exhaustion. Others were killed or injured by wild animals. After months of walking and unmentionable hardship, the boys eventually reached Ethiopia, where they stayed for approximately four years. However, civil war then broke out in that country as well, causing them to flee once again back to their war-torn country of Sudan. Many of the original survivors died on that return journey while crossing the deadly Gilo River. Those unable to swim were swept away in the turbulent currents. Others were eaten by crocodiles, attacked by hippos, or killed by enemy gunfire. The survivors remained in the bush of Sudan, hiding for approximately a year-and-a-half before making their way to the safety of the Kakuma Refugee Camp in Kenya. In all, these boys had traveled over 1,000 miles by foot before reaching their destination. By the time the journey was over, only half of the original 40,000 boys had survived. Over two million people died in this genocide, while millions of others have been displaced with no place to call home and no means of survival. In 2001 the United States government awarded refugee status to approximately 3,800 Lost Boys as part of the United Nations rescue effort. Against amazing odds, many of these young men have pursued a college education. With their resilience, faith, and strong motivation, the Lost Boys are adapting to the American culture and lifestyle. With new skills and vision, many hope that through their education they can bring hope and a future with positive change to South Sudan.